Welcome to Relais san lorenzo Web site. This site or any portion of this site may not be reproduced, duplicated, copied, sold, resold, or otherwise exploited for any commercial purpose that is not expressly permitted by Relais san lorenzo. By using and participating in this Web site you signify that you have read these terms and agree to be bound by and comply with them. If you do not agree to be bound by these terms, please promptly exit all sites. Relais san lorenzo reserves the right to modify these terms at any time and will publish notice of any such modification online at this site or elsewhere online. By continuing to access a site after notice of such modifications, you signify your agreement to be bound by the modifications. You may use our site for lawful purposes only. You may not use our site to post, transmit or otherwise distribute unlawful material. Examples of unlawful material include, without limitation, threats of physical harm, defamatory statements, pornographic material, and copyrighted, trademarked and other proprietary material used without proper authorization. You may not attempt to use or distribute tools designed for compromising security or take any action to compromise the security of this site. Examples of these tools include but are not limited to password guessing programs, cracking tools or network probing tools. You may not "flood" or disrupt our web site through any means or process. The information on this Web site is the property of Relais san lorenzo and protected by the international copyright laws. Except as expressly prohibited on this Web site, you are permitted to view, copy, and print documents within this Web site (such as papers, datasheets, and so on), subject to your agreement that all of the following conditions are met: 1. Your use of the information is for informational, personal, and noncommercial purposes only. 2. You will not modify the documents or graphics. 3. You will not copy or distribute graphics separate from their accompanying text and you will not quote materials out of their context. 4. You will display the above copyright notice on all documents or portions of documents and retain any other copyright and other proprietary notices on any copy you make. 5. You agree that Relais san lorenzo may revoke this permission at any time and you shall immediately stop your activities related to this permission upon notice from Relais san lorenzo. The permission above does not include permission to copy the design elements, look and feel, or layout of the Web site. Those elements are also protected by copyright law, and may not be copied or imitated in any manner. Relais san lorenzo does not accept or permit advertisements on its Web site, nor shall it be used to transmit commercial or personal advertisements, solicitations, or promotions. 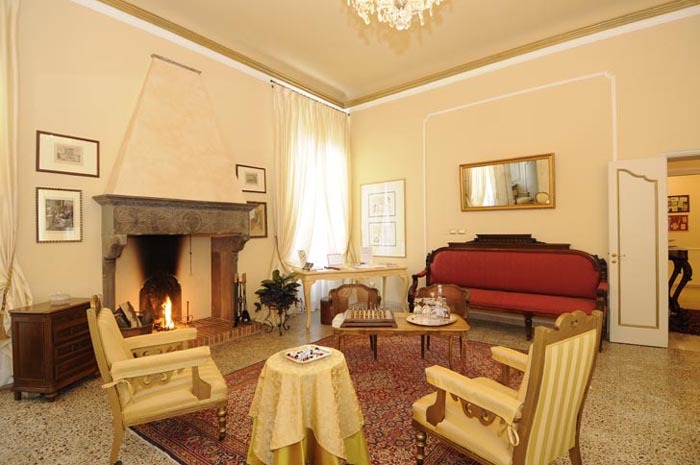 Relais san lorenzo Web site includes hyperlinks to sites maintained or controlled by others. Relais san lorenzo is not responsible for and does not routinely screen, approve, review, or endorse the contents of or use of any of the products or services that may be offered at this or any other Web site. We advise you to review the individual privacy policies of the respective sites.